Now that you’ve set up your WordPress blog and set up the basics behind-the-scenes the next thing you need to do is write your content. As they say content is king and pretty much the only reason people are going to visit your blog, so the more you can get out there, the better. However when people visit your blog you will want them to be able to find your content easily and quickly. This is where categories and tags come in. Categories and Tags help you sort and label your content so that people can quickly and easily find the specific content they’re looking for, without having to scroll through your archives. So what is a category? Categories are a way of diving your content into specific folders. For instance on News & Stuff our categories include Blogging and Social Media, Sales and Marketing, Websites and SEO etc. So every time we write a post it has to fall into one of these categories. This makes it easy for people to find the area they’re searching for and posts that they’re interested in. So why do we need tags? In the early days of WordPress tags didn’t exist. The only way of dividing up your posts was to use categories. This doesn’t sound like such a bad thing until a post didn’t quite fit into one of these areas, meaning that people were forced to create another more specific category. This meant that eventually people had huge never-ending lists of categories that looked a little insane. They weren’t attractive and they didn’t make sense. So WordPress added tags. This meant that people could create broader categories e.g. Weddings, Portraits and so on and still have a way of categorising a post even further. For example, if you wrote a review post about your new camera lens, instead of filing the post in “News” and then having to create sub-categories such as “Camera Gear” and then another within that entitled “Lenses”, you can just categorise it under News and then tag it with things like ‘camera gear’, ‘review’, ‘lens’, etc. Also tags are still clickable so people can view all the posts that have ever been tagged with ‘review’ but there is no official category added to the list. Still a little confused? Consider this – categories are like the contents page in a book whereas tags are the index. 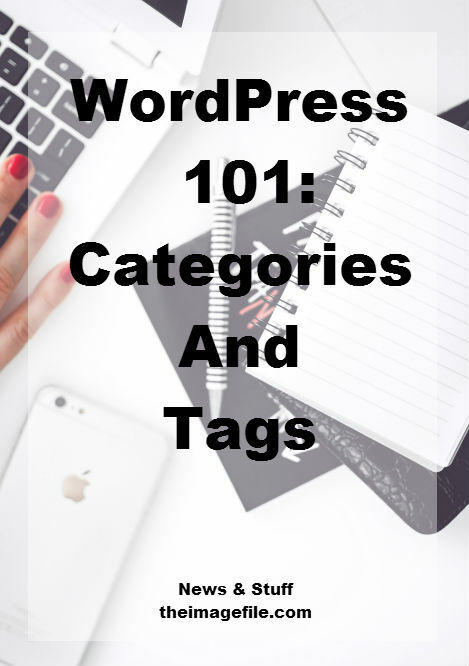 So when should you use categories and tags? Simply, all the time. Every post you ever write should be categorised because if it’s not you’re basically saying to your reader “I don’t know what this is about either!”. Readers want to have a vague idea of what a blog post is going to be based on before they even click on it and the only way they get that information is through you blog post title, categories and tags. Also using both categories and tags in every blog post is a way of making navigation easier and search engine optimisation better – it’s one of the most important things you can do for your blog. There are two ways of adding a new category. The first is to go to Posts > Categories. You will see a section called “Add New Category” where you can type in the category name then press the button that says “Add New Category”. Another way of doing this within a blog post. When you write a blog post you will notice multiple boxes on the right hand side. One of these will be called Categories. At the bottom of this box you will see a button that says “Add New Category”. To add tags to a blog post look for the box on the right hand side called Tags. Write your tags in the box (remember to put commas in between to separate them) and then press “Add”. WordPress 101: The Backstage Basics WordPress 101: How To Use Yoast SEO Properly WordPress 101: Top Security Tips For Your Blog 9 WordPress Tips And Tricks To Make Your Life Easier!